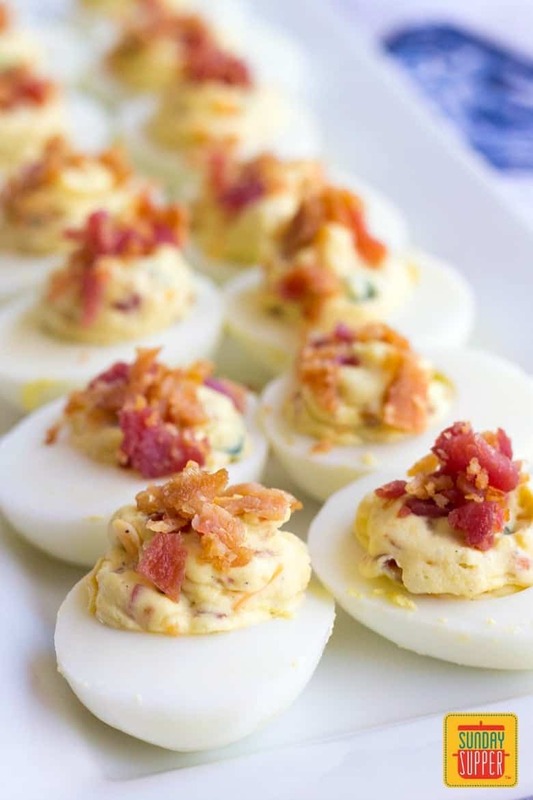 Jalapeno Popper Deviled Eggs are a crave-able party appetizer that’s perfect for everything from game day gatherings to parties and cookouts! Be sure to keep this recipe handy for an easy football food menu and don’t forget Labor Day. Deviled eggs are perfect for your Labor Day Menu! I’m a sucker for great deviled eggs. They’re so poppable and delicious. 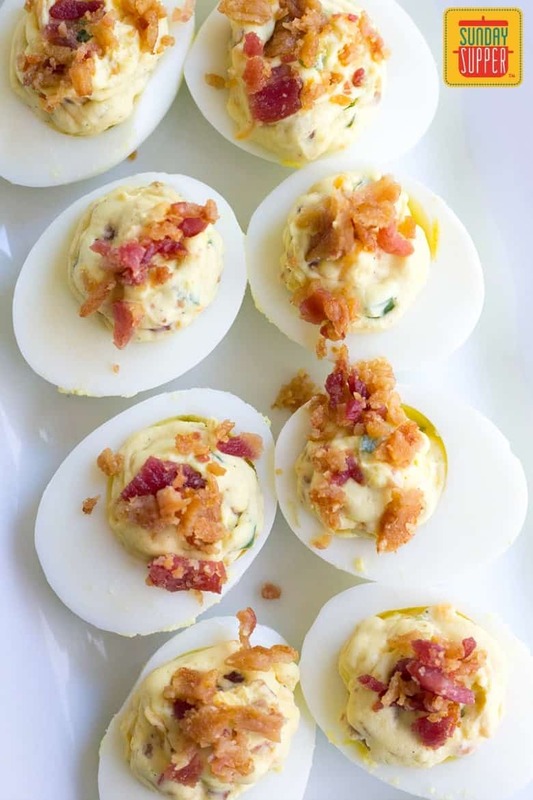 I’ve been obsessed with deviled eggs for a few years now, and while I love the classic recipe it’s the fun flavor combinations that really get me excited. One of my all-time flavor pairings is bacon and jalapeno. The salty bacon and spicy chilies go together so well! I can’t really believe I’ve never made them into a deviled egg before, but today is the day! Cook your eggs the day before and let them cool in the fridge overnight. Cold hard boiled eggs are 5 million times easier to peel than eggs at are still warm. I’ve tried them peeling eggs at every temp. Warm egg shells hang onto the egg white and you won’t get a smooth peel away. Cook your bacon in the oven. It only takes about 15 minutes and you can spend that time prepping the rest of your ingredients and smashing the egg yolks. Use a piping bag or Ziploc bag to get the filling into the eggs. It’s easier than using a spoon and you’ll be able to control the amount of filling easily too. These eggs come together really quickly once you have your ingredients prepped. Just smash your egg yolks in a bowl with a fork, add in the mayo & cream cheese for a rich flavor, add the seasonings & the jalapeno popper fixin’s and you’re in business! These eggs can be made a head of time and travel well. They’ll be the talk of your next potluck and everyone will want the recipe. If you liked this recipe, you’ll love these other egg recipes! 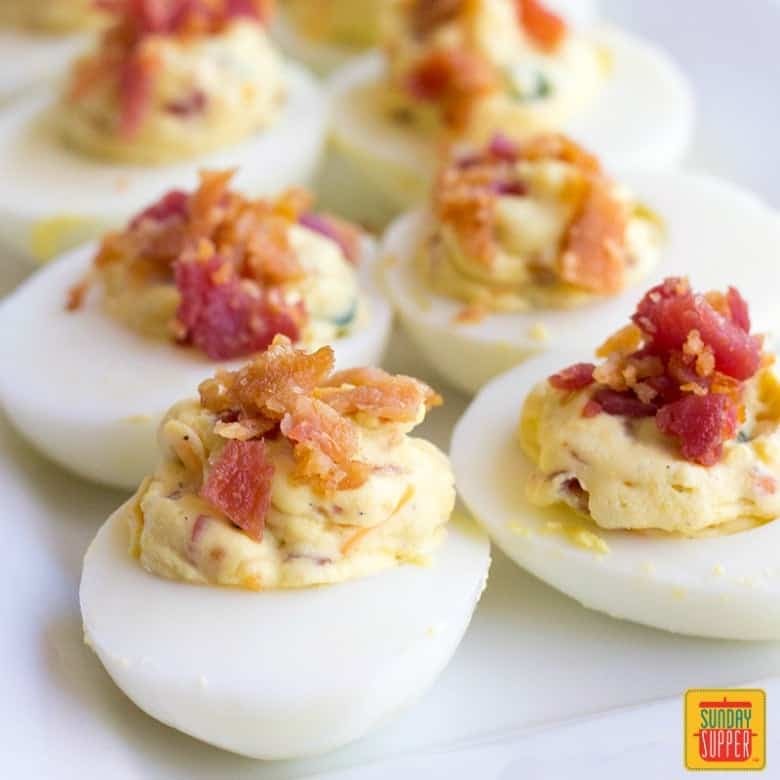 Jalapeno Popper Deviled Eggs are a crave-able party bite that's perfect for everything from game day gatherings to parties and cookouts! Cut each egg in half length-wise. Place the yolks in a medium mixing bowl and the whites on a serving platter. Use a fork to smash the egg yolks into a crumb-like texture. Add the mayo and cream cheese to the egg yolks. Mix until combined and smooth. Add the white wine vinegar, garlic powder, salt, and pepper to the yolks and mix to combine. Add 3/4 of the bacon, jalapeno, and cheddar cheese to the egg yolks and mix to combine. Transfer the egg yolk mixture to a piping bag or a Ziploc bag with one corner cut off. Pipe the filling into the egg white cavities, being sure to overfill the eggs. Sprinkle the reserved bacon over the filling. Serve immediately or cover and refrigerate until ready to serve. If you want to save some prep time on this recipe, you can buy peeled, hard boiled eggs at the store and use those for your recipe. Just prepare as directed. Oh, boy, these look incredible! Love the heat! 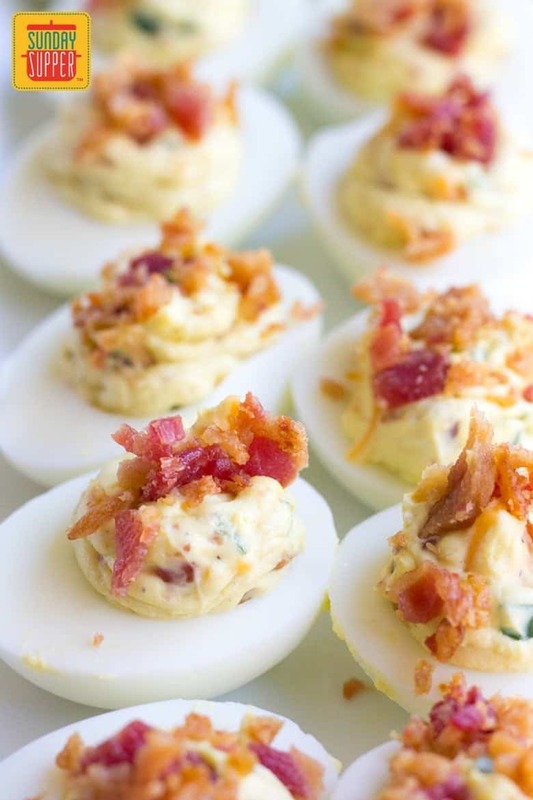 You can never have too many deviled egg recipes. 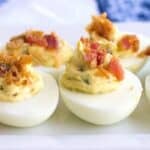 Great tips for making deviled eggs! Steaming the eggs instead of boiling, will rock your world! Makes even fresh eggs peel easily. I promise. 1 inch of water, steamer insert, any number of eggs, 14 mins. Done.